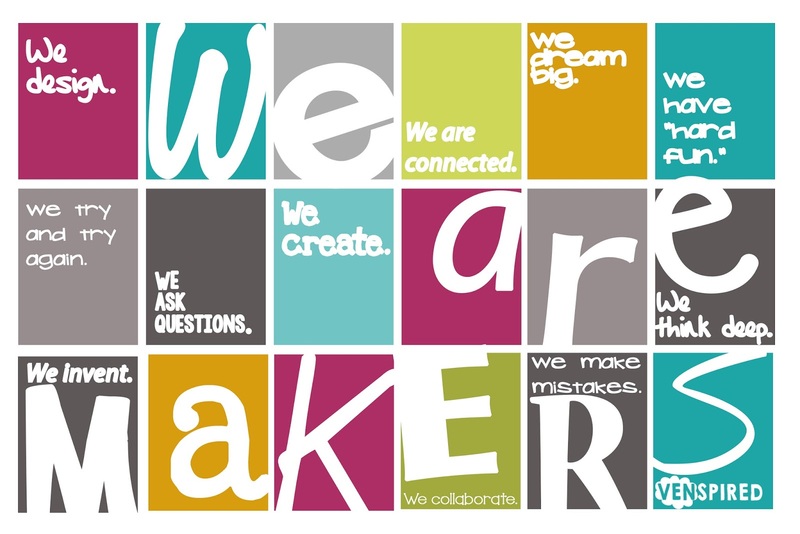 There are dozens of resources available to tell you about makerspace. How to create one, how to implement one, etc. Articles about libraries as the hub for a school's makerspace; articles telling you what you need to set up and what kinds of projects you might do; and many, many, many books to read to better understand and implement a makerspace. I was thinking about makerspace today as I was watching a couple of kindergarten students build a fantastic structure with wooden blocks. And then I was watching some kids make drawings influenced by a rather heated conversation about emojis. And later I watched some kids figure out how to create their own manipulatives so they could better understand a particular way of solving a particular kind of math problem. Makers. Making. And just randomly in a classroom. I agree that some resources for some kinds of makerspace activities require storage and often an electrical outlet so those tools also require rules. And I agree that having a space or resources for kids to use for specific kinds of tasks or problems, or for extension activities, or for supplemental work when they've finished their other work might require a separate space if only to reduce distraction for other kids and for storage. But I've also seen what kids can do with some craft sticks and Play-Doh®. Toss in some markers, a few sheets of construction paper, some chenille sticks, and random other stuff and who knows what they'll make? Give them access to a tablet or laptop with the ability to record something and stand back. Then they'll be asking for other stuff when they say "It would be cool if we had something that let us. . . " because they might know exactly what they want but they have an image in their heads for what they want to create, to make. So when schools and teachers talking about setting aside space so they can have a single place for making, I assume that's mostly for quality and damage control because making can be messy. If you're waiting for a budget or a special room for a makerspace, stop waiting. Get some craft sticks, duct tape in different sizes and colors, chenille sticks, styrofoam shapes, and whatever else. Mismatched buttons, leftover pieces of cardboard, small nuts and bolts that don't seem to have a home, leftover wire, glue sticks, yarn or string. All kinds of stuff you can pick up while walking through Michael's, Hobby Lobby, your garage, and elsewhere. If you want to be organized, but each of them in their own bins or baskets. Or just make the stuff available on a table or on a shelf in your classroom. Kids get to use and make something when they've finished their work. But they have to make some thing and they have to be able to describe what they've made and why they've made it. No sentence or paragraph requirements. Just something so you know they know what they made and why they made it that way or why they made it at all. They can write their descriptive information (index cards, cut out letters on construction paper, lengths of adding machine tape, scraps of paper taped together) or they can record it (podcast-like, paper slide, video). How do you grade it? You don't. They got to do it for fun. They learned something. 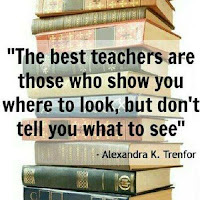 You learned something about them, and about how they think and learn and what intrigues or interests them. That is important data. I was hanging out with kinders not too long ago and one of the young boys was all over one of the coding apps. I told his teacher how engrossed he was and how good he was at figuring out how to complete the task. She pointed to the kid to make sure we were talking about the same little guy. We were. "Huh," she said. "I never would have imagined." And there you have it. One of the reasons we let them make. . .whatever they're going to make even as they make a mess. Because we too rarely imagine what could be and we too rarely give our students the opportunity to imagine. If you’ve ever read anything I’ve written, you know I get to work with teachers. And I do mean “get to.” I learn something every day about teaching, about learning, about perseverance because many of our teachers work in incredibly difficult situations. But this post isn’t about the ones who keep on keeping on. One of the young teachers with whom I recently worked wondered about the value of her degree. She’s been teaching for two years and this early in the school year is already certain she won’t be rehired next year because she disagrees with the mandates of the administration and the district. I’m of multiple minds here so bear with me. My first response was one of compassion and empathy. Teachers are pushed and pulled in many directions because of school and district mandates, many of which seem to be in conflict and many of which seem to be the flavor of the month. Teachers will often focus on the mandates that seem to be most important to their evaluations to retain employment. It’s true that many teacher education programs do not prepare their graduates for today’s teaching world. There are a lot of reasons for that and most of them are not defensible. However, there is also the fact that those school and district mandates often change every year. That, of course, contributes to on-going teacher frustration and anxiety, but also makes it nearly impossible for teacher education programs to keep current. There are policies and protocols for making changes to curricula and that takes time, especially because teacher education programs have to be mindful of requirements and expectations of accreditation agencies, both state and national. By the time some changes can be implemented, those changes could be outdated. That fast. Even so, there are ways to ensure that teacher education candidates are aware of some of the current trends and policies and understand those implications. On the other hand, it’s not as though the STEM/STEAM, PBL, and Maker movements are anything new and surprising and it’s not as though any education professor couldn’t integrate any or all of the above into their own learning activities for their teacher education students. The same can be said for integrating or infusing technology. And so, while curricular changes take time, instructional practice takes less and there is essentially no excuse for university teacher education faculty not to integrate timely, relevant, and authentic strategies and instruction for their benefit of their students as future teachers. After I thought a bit about this young teacher’s concerns, I got angry on her behalf, but then, not so much. You see, those of us who have graduated from college know there are some things we were expected (forced) to endure that had no apparent bearing on much of anything except that quirky interests of that professor. Ahhh, but there is learning in that. I realized that this young teacher was focusing mostly on the what she learned rather than on that she had learned about learning. 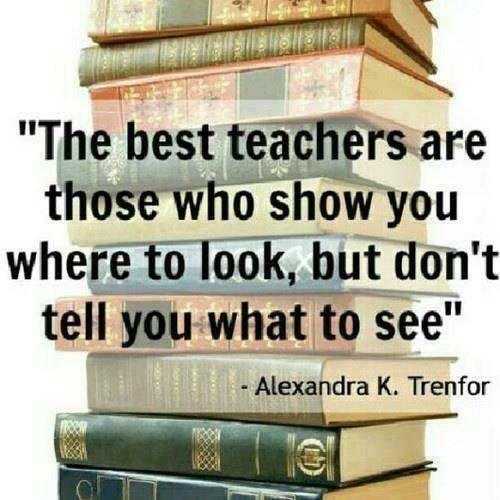 Yes, she needed to learn about pedagogy and how to teach her students how to read. But she also needed to learn how to reflect on the process of learning, to observe that her classmates learned differently than she did. When she did any of her practica or student teaching, she needed to learn that what she needed to observe were the students and their responses to the teacher not just the teacher herself. What she also needed to learn is that a degree is just a stepping stone, a right of passage in some ways. That degree in education means that you took some foundational courses and went through some fundamental experiences that would begin to shape how she began to develop her craft as a teacher. It did not in any way mean that she graduated from college as a fully formed teacher. As any teacher knows, learning is a lifetime business. 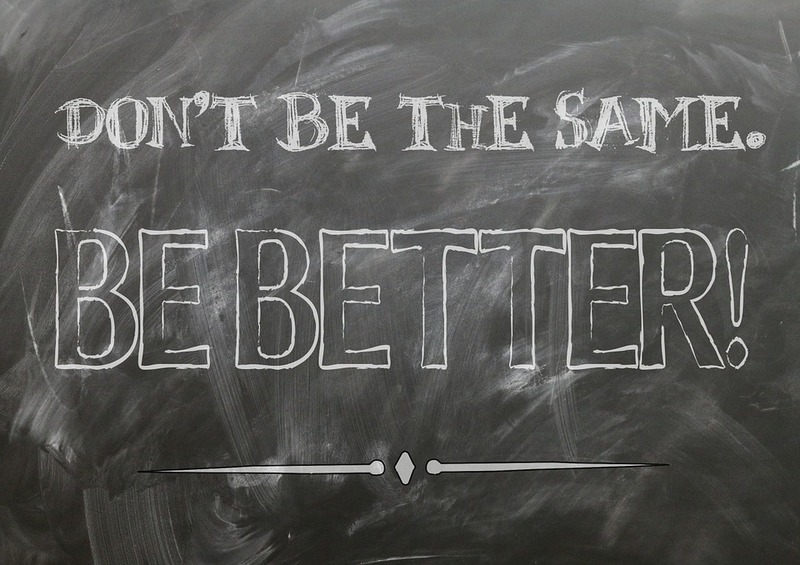 The best teachers reflect on the ways they strive to improve and to hone their crafts. They are no more welcoming of an onslaught of district initiatives that often add more chaos than help or administrators who are trying to build their legacies on their demands on the teachers and the students; however, they are grateful for a professional development experience that enables them to become a better teacher, whether it is because they have learned a new strategy or refined a new skill. This young teacher is still new to this profession. She’s barely begun her second year so she’s still finding her way, figuring out what works and what doesn’t. I think some of her frustration is that she hasn’t had time to find her feet and figure out her baseline strategies and so she’s overwhelmed by the demands and expectations that add to her stress, that seem to confuse what is expected of her, and that most assuredly make it harder for her to figure out where she needs to focus and on what she needs to work to become a better teacher. That she worries in November about getting rehired is concerning and suggests to me that it is this teacher who is rethinking her career choice. It’s possible she’ll simply give up and ride out the year. It’s possible she’ll continue to do what she can for her kids and look for a job elsewhere. I hope her plan is to look for a job elsewhere if she thinks this school and/or this district is not a good fit for her. But my fear is that districts will remain tone deaf to the many initiatives they insist on launching in the hopes that maybe, just maybe, one of those initiatives will be the one thing that turns around grades. Of course, they won’t, but that’s a different post. In the mean time, to all of those teachers who have felt called to teaching and have already reached a breaking point, I hope you hang in there. I hope you find someone who can hear you out and understand your frustrations. I hope you find someone who can mentor and coach you, especially through the difficult times. I hope you will not give up on teaching, on yourself, on your kids.